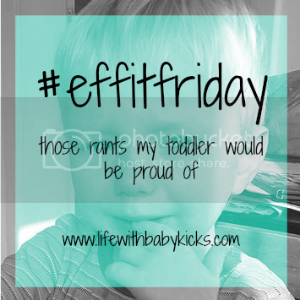 The ranty linky party that is #effitfriday is back once again. For all your rants that are Toddler-worthy. Funny. Serious. Any rants are welcome, as long as they are, well, ranty. Is one about labels. Not the itchy clothes type, but the whole “Mum Label” that people are so hell bent on giving us all. There were some absolutely brilliant rants out there this week, I cried with some of you over yours and couldn’t stop howling with laughter over others. It was a close contest, but I have to go with Musing Mumma blog as she really did open my eyes to how Santa is a felon. Now grab the badge and get ranting. Please feel free to link as many posts as you wish. Make sure to tweet me your link on Twitter @Laura_BabyKicks using #effitfriday and I will be sure to retweet for you. The linky will run from 6am GMT Friday till 23:55pm GMT Tuesday.